Behind Lincoln two men, one with his leg over a chair, comment on Lincoln’s reading. “Not quite appropriately costumed, is he?” comments the first. At left five ballerinas stand beneath a playbill advertising “Treasury Department, A New Way to Pay Old Debts . . . Raising the Wind . . . Ballet Divertissement.” Near their feet is a pile of silver and plate, “Properties of the White House.” They listen to a fiddler who, with his back turned to the viewer, stands lecturing before them. Nearby an obviously inebriated Secretary of State William Seward sits at a table with a bottle, muttering, “Sh–shomethin’s matt’r er my little bell: The darned thing won’t ring anyway confixit’.” Seward reportedly once boasted that he could have any individual arrested merely by ringing a bell. He was widely criticized for his arbitrary imprisonment of numerous civilians during the war. Union general Benjamin F. Butler (directly behind Lincoln), dressed as Falstaff, recites, “We that take purses, go by the moon and seven stars; and not by Phoebus! I would to God, thou and I knew where a commodity of good names were to be bought!” He holds a sign “Benefit . . . Falstaff . . . Beauty and the Beast.” By this time Butler had achieved notoriety as a dissolute plunderer. 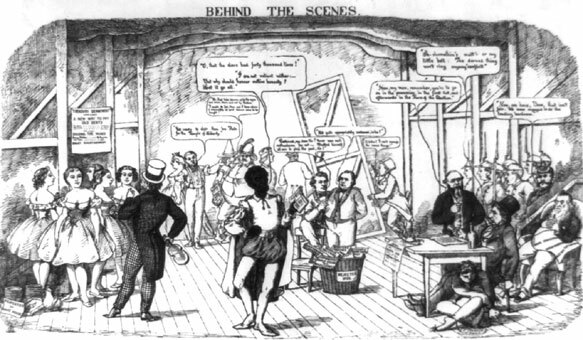 To Butler’s right a man (who might be the stage manager) orders the crew, “Get ready to shift there ‘ere Flats for the Temple of Liberty.” The artist of this and nos. 1864-30 and -31 was an exceptionally able draftsman. Judging from the acidity of these satires, he may have been a Southerner, perhaps a Baltimorean. The only satires of the time that compare in artistic quality and political venom are those of Adalbert Volck.